Originally from Touraine, Jean-Claude Courtault arrived in Lignorelles in 1974 as a chef of culture for a wine estate in the village. In 1984 , JC Courtault had the opportunity to acquire a vineyard then aged 4, planted in Chablis on 1.5 hectare. 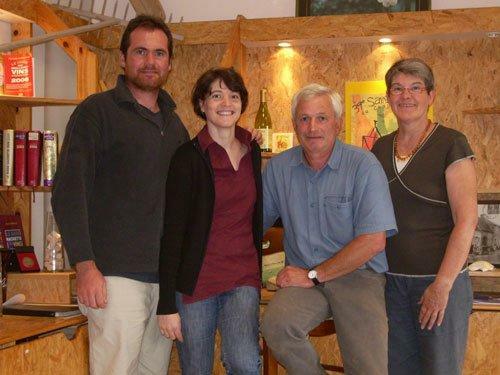 Then, he rents a plot of land in the Chablis appellation, which he plants with the help of his wife Marie-Chantal. The domain Jean-Claude Courtault is created . Over the years, while maintaining his responsibilities as a chef de culture, JC Courtault expands and operates his vineyard. He vinified his wines and began their marketing in bottles in 1987, vintage for which he won a gold medal at the Concours Général des Vins de Paris. This medal is the beginning of a series of awards that mark the career of JC Courtault, a sign of quality and consistency of his wines. The 1994 edition of Guide Hachette brings a commercial boost to the Domaine Jean-Claude Courtault, giving three stars to its Chablis 1992. In 1995, when the estate has a dozen hectares in Chablis and Petit Chablis, Jean-Claude Courtault decides to devote himself full time to its exploitation. He builds a cellar containing all the elements necessary to work in an optimal way. The estate has continued to develop its vineyard to reach its current area of ​​20 hectares . Having been able to acquire lands in Petit Chablis in their name, they decided to create in parallel their own estate " Stéphanie and Vincent MICHELET ". Today, Domaine Michelet operates 6 ha of Petit Chablis and 0.80 ha of Chablis, including a 60-year-old vine. And as history repeats, the first vintage bottle of Domaine Michelet, a Petit Chablis 2008, received a gold medal at the Chablis Wine Competition. Mutualisation of means and know-how. The two areas work in synergy by sharing buildings, equipment, and labor; the vines and the wines are driven in the same way, each bringing his know-how.